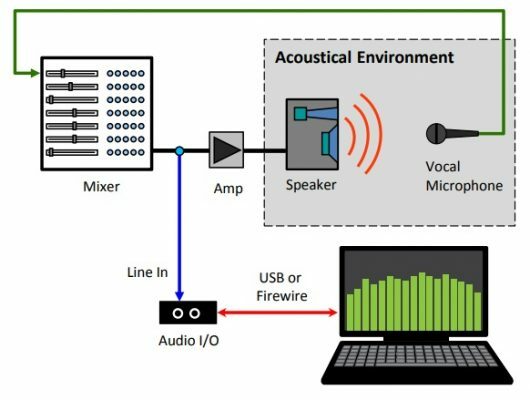 So as to provide an instant practical value to your measurement systems, even without the need for a measurement microphone, let’s go through how to use Smaart v8 in a live context to detect feedback frequencies. Figure 27: Electrical connection diagram to identify feedback frequencies with Smaart v8. Next, click on “Spectrum” and then on the split screen icon at the bottom center. Figure 28: Screen configuration for feedback frequency identification with Smaart v8. Since what we are analyzing is the mixing console’s output signal we’ll activate input 2 (“Reference”) on the card by clicking on the arrowhead. Figure 29: Activating the signal input channel. The image below shows the screen where we’ll see the effect of an instance of feedback. On the upper right side of both windows “Reference” should be shown. Else, we’ll need to click on the arrow to select it. On the upper left side of the top window “RTA” should be shown, while the upper left side of the bottom window should show “Spectrograph.” Else, click on the corresponding arrowhead and select the inputs and the type of analysis as I indicated earlier. Figure 30: Screen for feedback frequency identification. RTA on top and Spectrograph below. In our example we’ve used 1/3rd-octave smoothing and no Temporal Averaging, as you can see on the upper right side. The top part of the graph area shows an RTA, with frequency on the horizontal axis and amplitude on the vertical one. The RTA could be enough if we were watching the screen all the time. Since this can’t always be the case we’ll use the Spectrogram to help us. The bottom part of the graph area shows the Spectrogram, with frequency on the horizontal axis and time on the vertical one. This way, even if we’re not constantly watching the screen, when feedback takes places we’ll be able to see the frequency that lasts over time, making it easier for us to identify the feedback frequency. In our example you can see the effect of feedback at 1200Hz. On the RTA (upper window) we can see that the 1/3rd-octave band that corresponds to the feedback frequency is protruding. The Spectrogram (lower window) shows a continuous straight line on the vertical axis in the 1250Hz band. Since feedback often lasts over a certain amount of time (which sometimes feels like an eternity), the straight line will indicate the frequency at which feedback is taking place. In our case, the straight line shows up in white on the spectrogram, but it could show in other colours depending on the feedback level and the dynamic range, which can be selected by the two arrowheads to the left of the spectrogram window. The Min and Max levels are initially set at -66dB and -30dB. If we do not see the feedback frequency on the spectrogram, we’ll need to adjust the aforementioned arrowheads as appropriate. Each situation may call for different values. 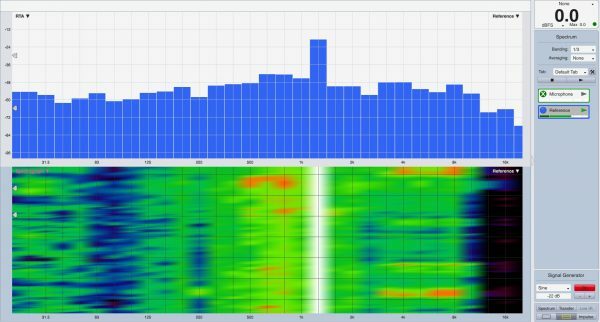 If correctly configured, when feedback occurs we’ll be able to identify a straight line that lasts over time in the spectrogram; and in the RTA we should be able to see how one of the bars protrudes from the rest. These measurement systems offer many possibilities that I have not talked about. This is only the beginning. 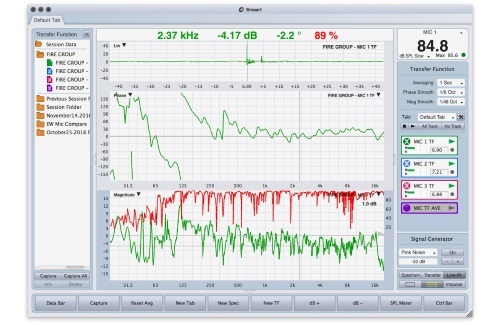 Smaart v8 has a detailed manual where you will be able to dig deeper and learn many more things. Considering all of what you need to do measurements (computer, sound card, microphone, measurement software), the company that develops the software is the smallest of them all, and probably the one where you would find the most people who share your interests and the people you would be most comfortable engaging in conversation in a bar. They deserve making a living from their work like everybody else, just like yourself. So, I would like to ask you to use legally acquired software so that they can continue to help us achieve better sound. Thanks to José Brusi, Xesc Canet, Pepe Ferrer, José Moldes and Germán Ramos for their suggestions, correction of errors and contributions to this article. And thanks also to James Woods from Woods Engineering and Jamie Anderson from Rational Acoustics.